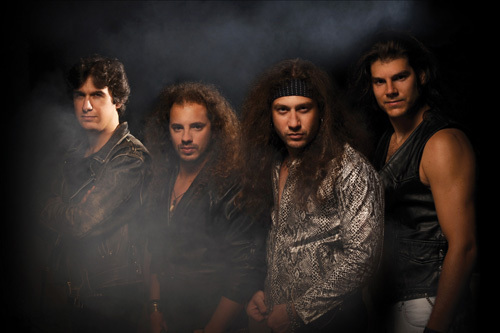 Keeping the flame of old school heavy metal burning in their native Greece is Crimson Fire. Born around 2004 the band has been a faithful presence in Greece, delivering their first album in 2010 and going to support many major metals such Anvil, Helstar, Demon, Tokyo Blade among others. 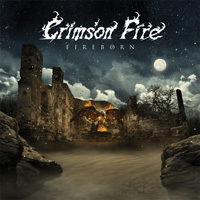 They return six years later with their second album, Fireborn, released via Ptich Black Records. Perhaps the first thing to say about the album is two-fold: it's fast and short. For their traditional metal, Crimson Fire relies heavily on the quickness of speed metal to energize their heavy power metal. And the songs, on average, clock in at around three and a half minutes. Yet in those said minutes you get songs built not just upon pace, but blistering charging riffs, quick soaring soars, and thundering rhythm section, and traditional clean, bit screamo, heavy metal vocals. (However, I found Johnny B's vocals a bit muted in the mix at times.) Songs like Eternal Flames, Take To The Skies, Only The Brave, and Knightrider essentially leap from the gate and keep charging forward. Alternatively, there is some moderation in speed with Hunter or Master Your Destiny, if ever so slight. And within Bad Girl you might hear a small amount of rock groove. Even when they slow things down as at the start of Her Eyes, with acoustic guitar and keys, it's somewhat of a luring deception. At the midpoint the race is on again as the speed power metal returns. All in all, Fireborn is authentic and energetic "keep it true" heavy/speed metal wrapped in the package of the proverbial three minute song. I think the only thing that holds it back from greatness is that the songs, as a whole, seem to run together with inherent and obvious redundancy. If you listen to a few songs at the start, you pretty much know what's coming the rest of the way. Otherwise, as I said, Crimson Fire's Fireborn is a fine effort. All in all, Fireborn is authentic and energetic "keep it true" heavy/speed metal wrapped in the package of the proverbial three minute song.